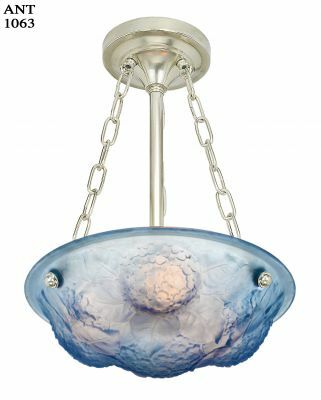 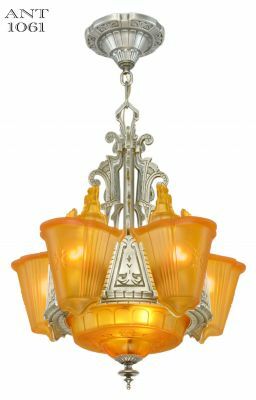 Consolidated Lamp & Glass Co of Corapolis, PA was one of America’s finest glass makers before and during the Great Depression. 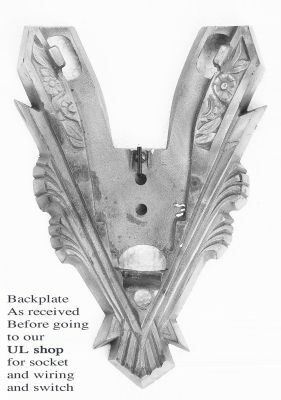 This Martele’ example is dated between 1931 and 1936. 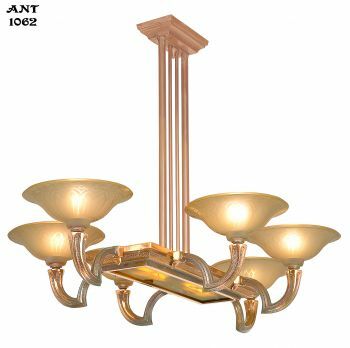 Unfortunately....Consolidated went bankrupt no less than three times during the Great Depression. 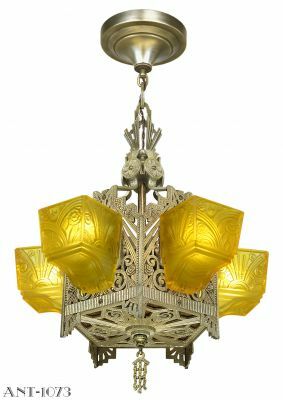 They made outstanding consumer products i.e vases, bowls etc and most outstanding shades and lighting. 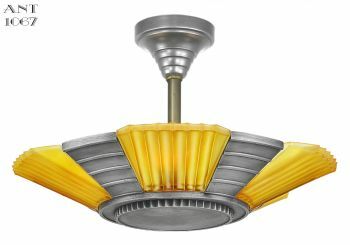 And everything that they made was the absolute BEST quality America had to offer to the world. 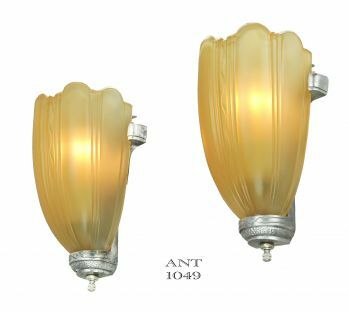 Elaborating designs from the French Exposition Des Arts Decoratifs... of 1925, they brought out some absolutely wonderful shade and fixture designs. 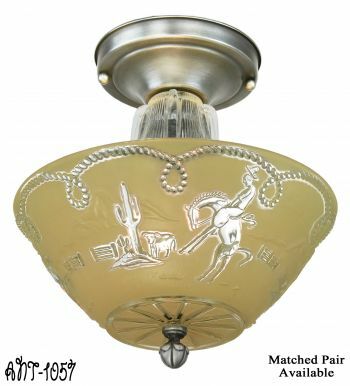 They made shades for their own lighting line, and for other lighting manufacturers such as Moe Bridges. 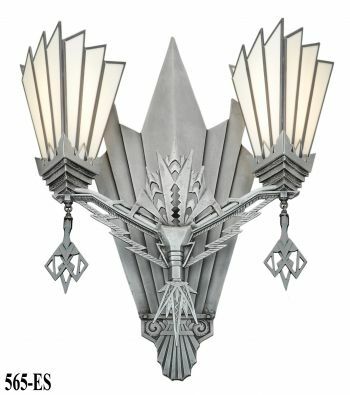 They were simply a great company. 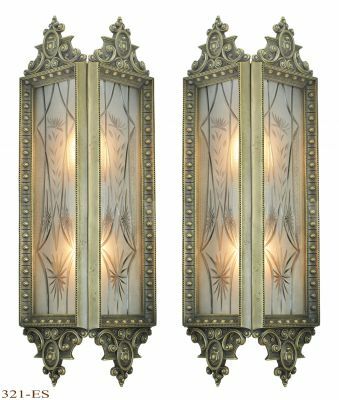 This pair of sconces were just being produced in a co-operation between Moe Bridges and Consolidated, when Consolidated first got into trouble during the depression. 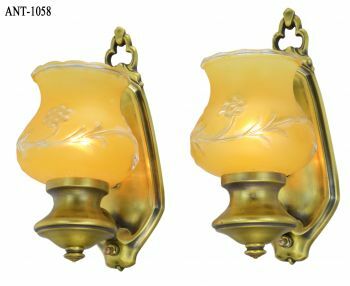 There are pencil reference flyers by Moe Bridges and rough catalog representations from Consolidated both showing these sconces. 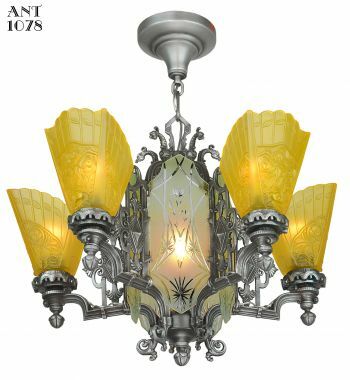 Consolidated stated: “suitable for lighting the best modern homes”. 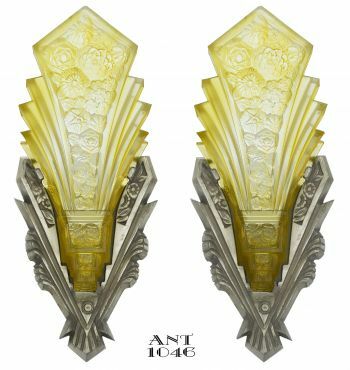 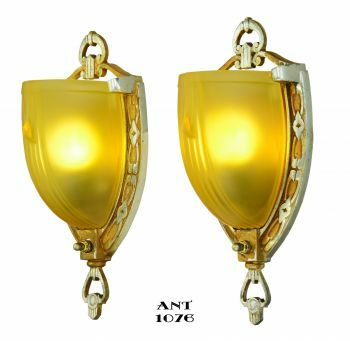 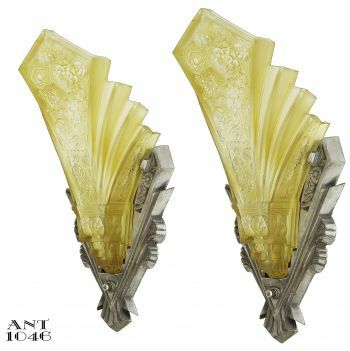 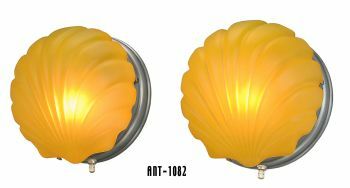 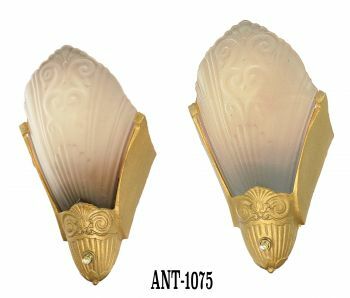 This pair of sconces is denoted as a VERY iconic pair of slip shade sconces of the Art Deco era. 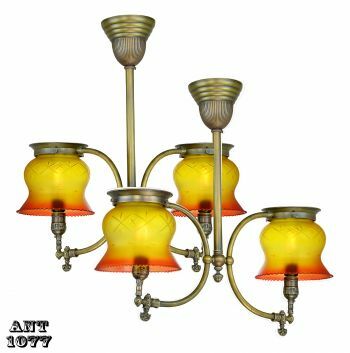 They simply are outstanding in design and not often found for sale. 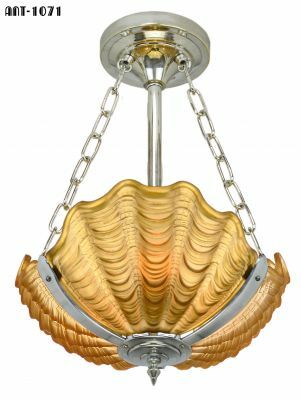 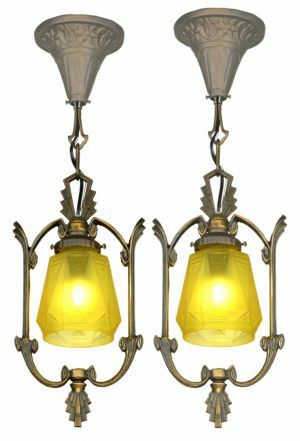 They come from Consolidated’s own “Martele’ Line” and have a pewter finished, cast iron, frame with their outstanding Martele iconic Art Deco shades. 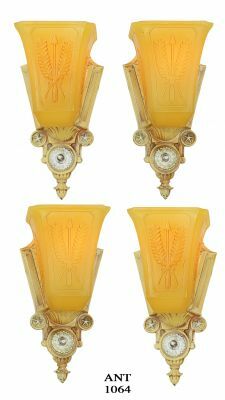 Another nice factor is that these sconces ARE signed in the metal casting as casting number G113 and also Moe Brothers Mfg. 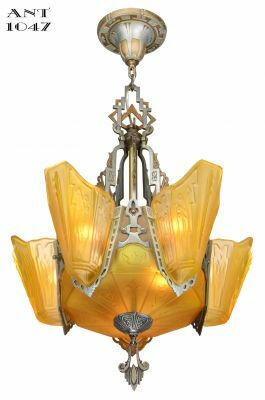 Co, Milwaukee who were working in combination with Consolidated Glass and it was intended that both companys would market them. Measurements: 13 1/2” tall by 6 1/2”wide. 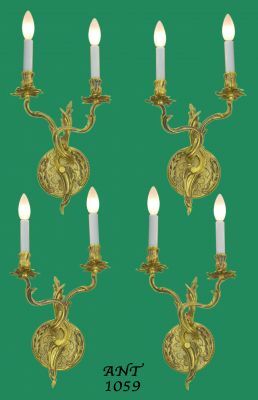 They project into a room 5 3/4”. 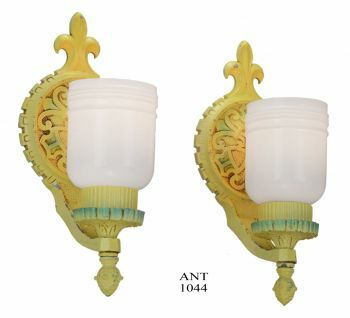 These sconces have been completely re-wired, in our UL shop, with new sockets to conform to UL guidelines. We are showing you a picture of the backplate only, in the typical condition when received...only to show the nice detail of these backplates. 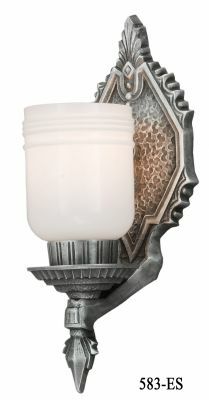 The pictures of the complete sconces are after re-wiring and clean up. 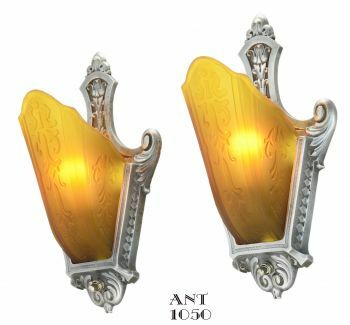 We re-wired these sconces so each socket is capable of accepting a 100 watt bulb...but...we would recommend smaller wattage incandescent or LED bulbs to protect the now older glass shades. 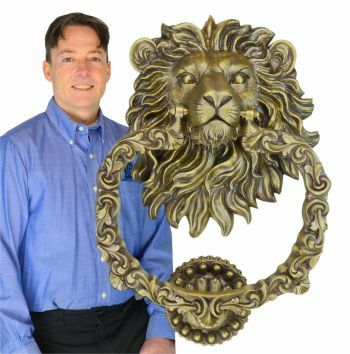 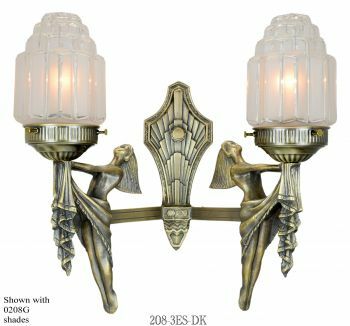 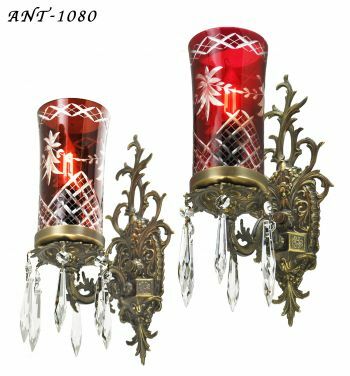 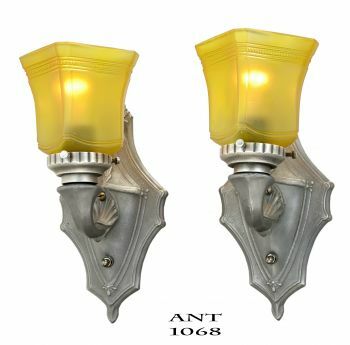 Price: Remarkable Consolidated/Moe Bridges co-operated sconces, UL re-wired $1,500.00 per pair....plus careful shipping. 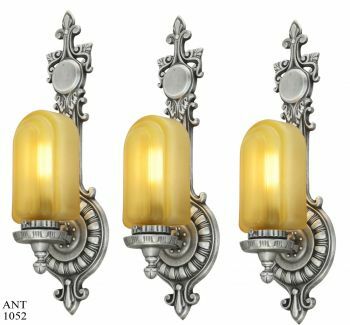 We took another FOUR of these beautiful sconces from a fine home. They are for sale by PAIRS....each PAIR is 1,500.00....how scarce a find these are.